Are you starting a business that entails online shopping or are you selling or planning to sell stuff online? The main thing about selling stuff online is order fulfillment. How convenient is it to use their services? Do they have an app or are they only web based or by phone? Most sellers nowadays usually go for the shipper with the mobile apps. They can be purchasing their goods and booking or scheduling a pick-up while on the go. One thing with apps, especially with Google Play, always go through their reviews. If a majority of reviews are positive then the shipper may be doing their job.. If the reviews are more of complaints about the app, the customer service, their pick-up personnel, well you just got to go and search for another one. Aside from reviews, you may always ask around on Facebook with other sellers with whom they send business to. You can always try a shipper with one non-time dependent and non-vital delivery to see if you could work with them. 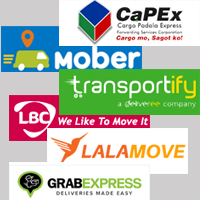 Cargo Padala Express (CaPEx) Forwarding Services Corporation is a publicly listed corporation registered in Securities and Exchange Commission (SEC). It has legally secured government permits and fully authorized to operate as a cargo freight forwarder by Civil Aeronautics Board (CAB) for its air freight as well as by the Philippine Shipper’s Bureau (PSB) for its sea freight business transactions. It is premium delivery service that we are currently running to provide convenience to our customers. By booking on the app, you can send items such as documents, parcels, and gifts to your business partners or loved ones. They provide an on-demand delivery service with real-time tracking and notifications. Transportify is a mobile and web app that allows you to book and manage pickups and deliveries of almost anything. Our marketplace connects businesses and individuals with qualified drivers and their vehicles to provide affordable courier services according to our high quality standards. Transportify’s marketplace-driven pickup and delivery network is built on an advanced yet easy-to- use online delivery app that differentiates us from any traditional delivery company in the Philippines and throughout Southeast Asia. Originally known as EasyVan, Lalamove was launched to satisfy a specific logistical need – van hiring. Started in Hong Kong in December 2013, Lalamove now operates in 100+ cities across China and Southeast Asia. Today, Lalamove unceasingly matches 15,000,000 registered customers with a pool of 2,000,000 drivers of vans, trucks and motorcycles. Disclaimer : Any reference in this website to any person, or organization, or activities, products, or services related to such person or organization, or any linkages from this web site to the web site of another party, do not constitute or imply endorsement or recommendation. Each company offers a similar service like the other and may need you to experience each one to know which is right for you. Again, please read the reviews before settling down with one supplier.